Pneumatic tools still provide an essential method for the removal of surface deposits in hard to reach areas. SPE can supply you with the tools you need - from needle scalers to scaling hammers. SPE needle scalers are an effective method for the removal of paint, rust, corrosion and accumulated scale from almost any surface. The SPE range offers a comprehensive choice of sizes to suit any application from cleaning and renovating stone to the removal of salt water corrosion from ship hulls. 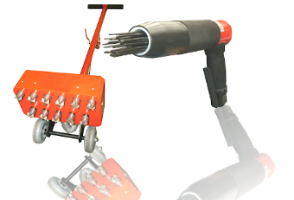 Their wide range of uses can be extended further by replacing the needles with a chisel enabling the tool to be used for chipping, splitting and scraping applications. All components used are of a very high standard ensuring years of trouble free operation. A low vibration model (type 303) is available reducing exposure to HAV. Different types of needle and chisel are available to suit various applications.